Using WISE, researchers have discovered more than 400 dust-shrouded nurseries of stars that have helped them trace the shape of our galaxy’s spiral arms. This artist’s concept depicts the most up-to-date information about the shape of our own Milky Way Galaxy. We live around a star, our Sun, located about two-thirds of the way out from the center. The job of mapping our Milky Way Galaxy from planet Earth, situated about two-thirds of the way out from the galaxy’s center, is similarly difficult. Clouds of dust permeate the Milky Way, blocking our view of the galaxy’s stars. 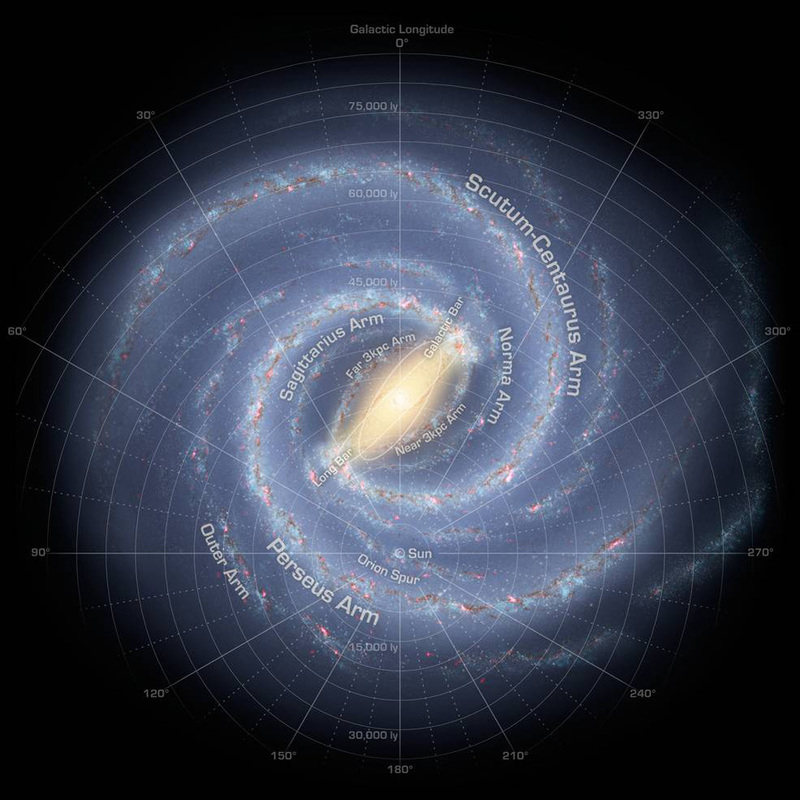 Today, researchers have a suitable map of our galaxy’s spiral structure, but, like early explorers charting new territory, they continue to patiently and meticulously fill in the blanks. Recently, researchers have turned to a new mapping method that takes advantage of data from NASA’s Wide-field Infrared Survey Explorer (WISE). Using WISE, the research team has discovered more than 400 dust-shrouded nurseries of stars, which trace the shape of our galaxy’s spiral arms. Seven of these “embedded star clusters” are described in a new study. “The Sun’s location within the dust-obscured galactic disk is a complicating factor to observe the galactic structure,” said Denilso Camargo from the Federal University of Rio Grande do Sul in Brazil. Astronomers using data from NASA’s Wide-field Infrared Survey Explorer (WISE) are helping to trace the shape of our Milky Way Galaxy’s spiral arms. This illustration shows where WISE data revealed clusters of young stars shrouded in dust, called embedded clusters, which are known to reside in spiral arms. The new WISE study finds embedded star clusters in the Perseus, Sagittarius, and Outer arms. Data from the Two Micron All Sky Survey (2MASS), a ground-based predecessor of WISE from NASA, the National Science Foundation, and the University of Massachusetts, Amherst, helped narrow down the distances to the clusters and pinpoint their location. Embedded star clusters are a powerful tool for visualizing the whereabouts of spiral arms because the clusters are young and their stars haven’t yet drifted away and out of the arms. Stars begin their lives in the dense gas-rich neighborhoods of spiral arms, but they migrate away over time. These embedded star clusters complement other techniques for mapping our galaxy, such as those used by radio telescopes, which detect the dense gas clouds in spiral arms. WISE is ideal for finding the embedded star clusters because its infrared vision can cut through the dust that fills the galaxy and shrouds the clusters. What’s more, WISE scanned the whole sky, so it was able to perform a thorough survey of the shape of our Milky Way. NASA’s Spitzer Space Telescope also uses infrared images to map the Milky Way’s territory. Spitzer looks along specific lines of sight and counts stars. The spiral arms will have the densest star populations.